SOS: Puerto Rico Is Losing Doctors, Leaving Patients Stranded : Shots - Health News Every day, at least one doctor in the economically challenged U.S. territory moves to Florida and other states where they're well-paid and better jobs abound. 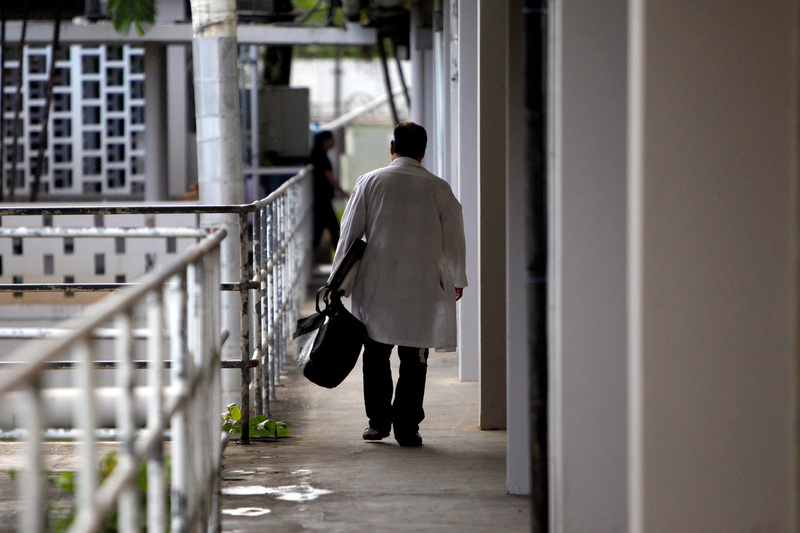 A doctor walks through a hallway at the Centro Medico trauma center in San Juan, Puerto Rico, in 2013. A medical exodus has been taking place for a decade in the Caribbean territory as doctors and nurses flee for the U.S. mainland, seeking higher salaries and better reimbursements from insurers. Puerto Rico is losing people. Due to a decade-long recession, more than 50,000 residents leave the U.S. territory each year--most for jobs and new lives on the mainland. This issue is especially affecting healthcare, where it's estimated that at least one doctor leaves Puerto Rico every day. The mass exodus of doctors is creating vacancies that are hard to fill and waiting lists for patient care. Dr. Antonio Peraza is among those doctors who recently left for the mainland. He specializes in internal medicine and for nearly 14 years, had a private practice in Bayamon, Puerto Rico. His was a wrenching decision to close his practice and take a job offer in Miami, Florida. "I wish you could have seen my patients. My patients, the day I told them I was going to close my office, they cried," Dr. Antonio Peraza says. "I felt like I was betraying them." For decades, long before Obamacare, Puerto Rico has had a government-run healthcare system that provides coverage for nearly everyone on the island. It offers generous benefits, but has never been adequately funded. Nearly two-thirds of the island's residents are covered by Medicaid or Medicare. But both of those programs cap payments to Puerto Rico at levels far below what the states receive. And in the last few years, Peraza says Medicare payments—already low—have been cut further. "What they have been doing unfortunately is taking these Medicare cuts and passing them along to providers and the patients. Which, we are the weakest link of the chain," Dr. Peraza says. Faced with a declining income, Peraza decided to move to Florida and sell his office building and practice in Bayamon. But so far he says, he hasn't found a doctor interested in buying him out. "Because most of them are in the same plan as I am doing. Maybe they are a little behind. Plan B is you have to leave the island because there's no other way, there's no choice," he says. Congress is working on a plan to help Puerto Rico fix its economic problems and avoid defaulting on its more than $72 billion debt. Puerto Rican officials are hoping the plan will also include an increase in Medicare and Medicaid funding. Meantime, the exodus of doctors, nurses and other healthcare professionals is making it hard for hospitals and clinics on the island to fill vacant positions. Puerto Rico already had a shortage of specialists. Domingo Cruz Vivaldi is vice-president of San Jorge Children's Hospital in San Juan and he says, with so many doctors leaving, it's getting worse. "To see an adult rheumatologist right now, today, the waiting period it can be four to five months. And some of them are moving out. And then to replace those physicians, it takes a decade," Cruz Vivaldi says. The outlook is no better for young doctors just starting their careers. At the University of Puerto Rico, one of four medical schools on the island, Manuel Rodriguez is doing a residency in orthopedic surgery. He says of his friends, only about one in five plan on staying in Puerto Rico to practice. "I would love to stay here," Rodriguez says. "But seeing the reality we live every day here with the resources that the hospital has, with the resources that the government has. It's difficult to think that we're going to stay here in Puerto Rico." After his residency, Rodriguez says he'll look for a fellowship on the mainland. Fourth year medical student Milagros Lopez says opportunities and pay are better there, but Puerto Rico is home. "There's a huge economic incentive to stay away, which is a sad, sad truth. But the thing is, we are a different group of people," Lopez says. "This has our home, our family, our language. So, I think there is an attachment that's kind of unavoidable there." Lopez says she hopes to come back to Puerto Rico after completing a fellowship on the mainland, but knows life might intervene. Her brother left for a surgical fellowship in the states five years ago, she says. Today, he's married, has two kids and lives in Detroit.